Ballygarrett Art Studio: Size matters! Towards the end of August there was great excitement in the studio. 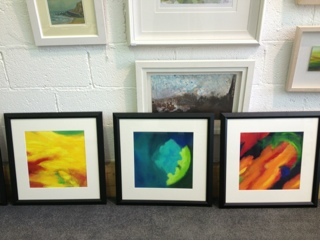 A visitor to the GasLamp Gallery in Gorey had seen my work and wanted to purchase two paintings and commission four more! Fab and Wow! On going up to talk to Chris, the framer and a real knowledgeable guy in the business of selling art, the 'potential buyer' wanted SIX of my paintings for an alcove in his house. But they had to be a particular size. There is a curiosity I maintain about how people buy art: will it fit, will it match my colour scheme, is it an investment? do I love it? In the studio I reviewed what lurked, framed work and unframed finished work and work that was unfinished with potential. I selected eight pieces returning to the gallery the following day, Chris and I discussed a selection of six and mounting them in the correct size for the buyer to view. A few nervous days ensued as I waited for news. Nothing is ever sold until the money is in your bank. The work looked good, and the buyer selected six from the unframed pieces. They were the right size. I'm glad the original two he picked were not cut down to size this would have be a disaster for one of the paintings. This all comes down to listening to what the customer wants and not being over precious about work made. That's a tightrope and artist walks if they want to sell work. For me it is important to sell. 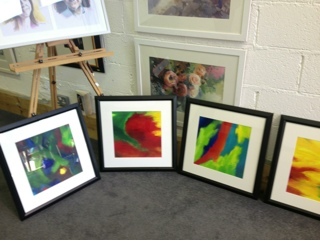 I am delighted that a new patron now owns six pieces of my work. That's happened before where someone buys several pieces. My painting work is colourful, energetic and has presence. It is not everyone cup of tea, patrons describe being drawn to it. So hopefully more people who like art colourful, energetic and with presence will be drawn to it and I look forward to selling more, Yay!